Have you ever been to Lisbon in Portugal? If you ever get the chance go and visit this lovely city by the sea. It has a great old town with lots of great restaurants, shops and terraces to sit outside and enjoy the sun. When you are there do not pass up on the opportunity to eat a pasteis de nata. These Portuguese custard tarts are also known as pastel de Belem or pasteis de Belem. When you roam the streets of Lisbon you can find them everywhere. In every bakery shop or in a cafe you can get these pastries. The best and most well known pasteis de Belem can found in the Belem suburb. You can buy them in a pack of ten and literally thousands and thousands of these pastries are made every day. 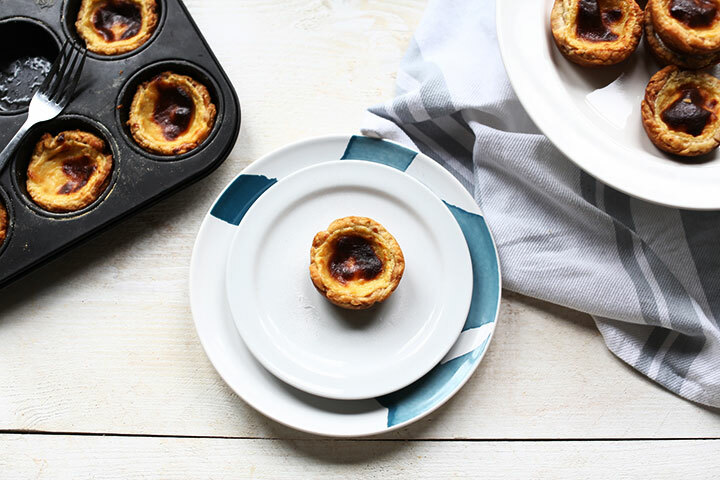 Until you actually go and visit I will show you how you can make these little pastries yourself with this pasteis de nata recipe and have a touch of Lisbon at home. Just like the oven baked apple beignets I used store bought puff pastry for this recipe and made the filling myself. It is quite easy to make as you have to make a custard. You start with two egg yolks and the sugar. Then add the flour and whisk that into a smooth cream while you slowly heat milk. This pasteis de nata recipe requires vanilla and if you have fresh vanilla scrape the seeds from the vanilla pod and put that in the milk. If you do not have fresh vanilla you can use vanilla extract. Heat the milk slowly and do not boil. Take about two table spoons of milk and add this to the egg cream stir it loose. Finally add the egg cream to the milk. Warm the milk further to a slow boil so the flour can set and let it cook for 2 minutes on low heat (you should see an occasional bubble). Now take a large plate and make it wet with a little water (do not dry the plate). Put the custard on the plate and put foil on it, to let it cool. This will prevent the custard drying out. I used a puff pastry roll and sprinkle some cinnamon on the puff pastry. Roll it up again an cut into 12 equal pieces. Let the puff pastry cool in the fridge for 10 minutes before you roll each circle into a bigger circle. Push them into a muffin tin. Now it is time to divide the custard across the 12 pasteis. 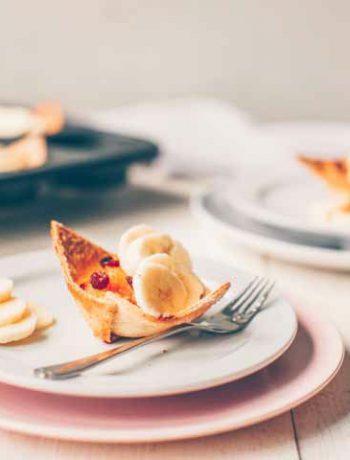 Preheat the oven at 480℉/225℃ and bake the custard tarts in about 25 minutes. The custard should have brown blisters, then they are done. Let them cool slightly and sprinkle with some icing sugar. Eat immediately. Delicious! 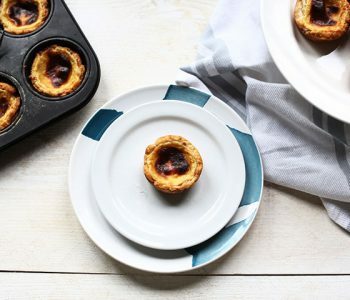 Have fun with this pasteis de nata recipe! 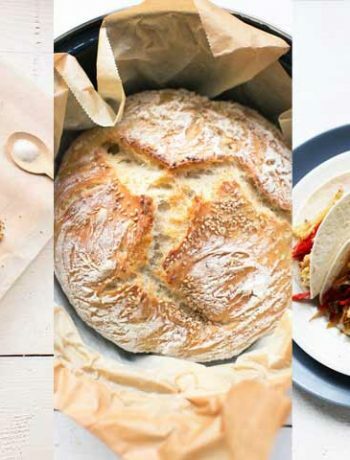 Made a recipe tag @thetortillachannel on Instagram or PIN it on Pinterest. 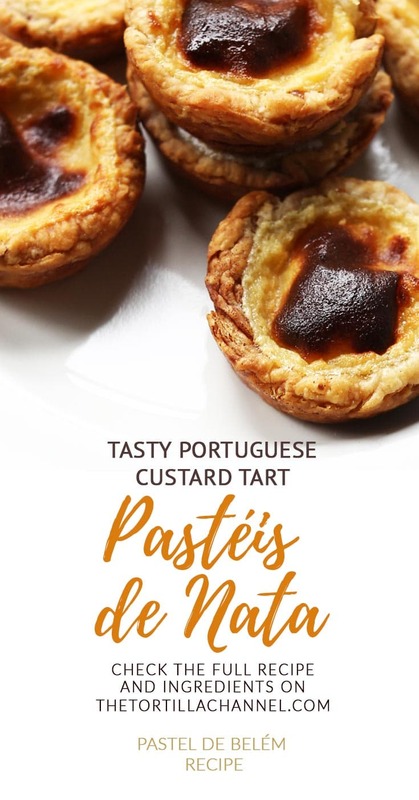 This recipe shows you how to make pasteis de nata also known as pasteis de Belem which are custard puff pastries from Portugal. Video included. 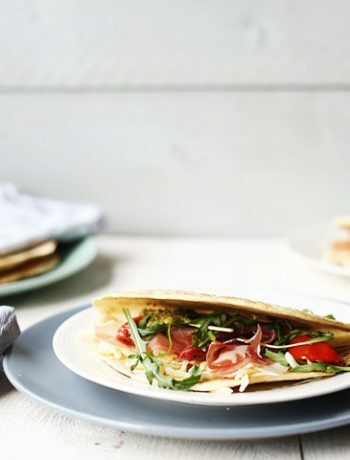 Delicious looking. Your photography is wonderful as well. Thank you so much for you nice comment and feedback. I will clarify further in the recipe what I mean with the wet plate. It is indeed for cooling and also to prevent skin forming on the custard.